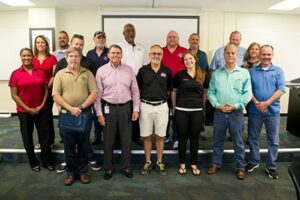 apprentices representing different industries were recognized for their outstanding performance; Courtney Green, (Machining), David Hernandez, (Operating Engineers), Tavares Jackson, Fort Lauderdale Housing Step-Up) and Nick Klaybor (Broward County Plumbers). The apprenticeship staff at ATC include Robert B. Crawford, Director, Roseanne Farino, Apprenticeship Department Coordinator, and Maria Kavallas, Apprenticeship Department. Apprenticeship is a method of training individuals in a trade using a combination of on-the-job skills development and classroom/lab related instruction. There are both union and non-union programs. Apprenticeship training programs in Florida operate in accordance with federal and state laws and rules. Apprenticeship training offers the individual a chance to “earn while you learn.” In addition to a paid 40 hour on-the-job training work week under the supervision of a journeyperson, apprentices are required to attend related training on selected evenings and/or weekends. Wage increases are granted as the apprentice gains time in training and acquires experience. Apprenticeship training programs vary in length depending on the trade and can take from three to five years to complete. Atlantic Technical College serves as the Apprenticeship LEA (Local Educational Agency) for Broward County Public Schools, and coordinates the largest apprenticeship training program in Florida. Upon completion of an Apprenticeship program and meeting eligibility requirements, students may be able to transfer college credits to Broward College toward an AS Degree. For more information, call the Apprenticeship Training office today!